Anyone who knows me understands how difficult it is for me to spend money. I even have a bunch of swagbucks saved up, and I still can’t bite the bullet and spend them. I keep thinking I’ll find a used Vitamix, but that’s not happening either (Craig’s List knows me well). I ponder and debate purchases that aren’t from the yard sale department, but when I do decide to invest my hard earned dollars in something, it’s quality, and I don’t want one bit of buyer’s remorse. I want to know that by giving those saved dollars a smart job, it will be worth every penny. We have all watched those “As Seen on TV” infomercials which show the newest kitchen gadget, guaranteed to save hours in the meal making process. We get them home, use them once, and realize they just take up room. (That’s when you sell them in your yard sale and I buy it for $2. It doesn’t hurt nearly as much to determine it’s a space waster when it was bought for a few dollars.;)). 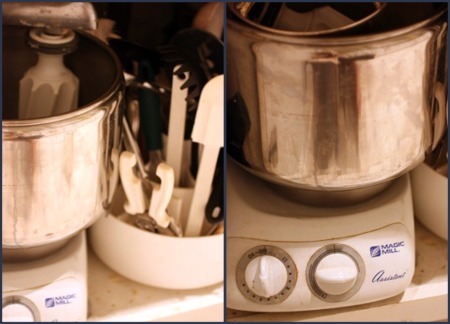 I believe in saving for and investing in quality kitchen tools that I will really use, and my biggest kitchen tool investment to date has been my Magic Mill DLX Mixer – The Electrolux Assistent Bread Mixer.. Besides my Kitchen Aid Mixer, which is still going strong after nearly 18 years, my DLX wins by reaching it’s 14 anniversary. I have never regretted that kitchen investment. Having just moved to NC with a newborn and a 19 month old, I was incredible home sick. We left the church with which I had been on staff, and I was mourning the difficult transition. I had immersed myself in a very healthy cooking and eating plan, and knew that I wanted to purchase a grain grinder and heavy duty bread mixer (larger than a Kitchen Aid). I spent months researching which would be the best purchase, but soon realized that this wasn’t a place to cut corners. The problem? We were a young couple, starting our own business, and this mixer alone was $500. (Yes, pick your jaw off the ground…now, it’s over $600.) I didn’t have a blog that might allow me to review it for free, and considering I could not remember the last time I spent $500 on anything, I had to create a savings plan. Long distance calls were my downfall then (remember, I was home sick). The age of free minutes had not arrived, so I made a commitment that for every dollar I saved in long distance phone calls, I would put that money towards my mixer. Well, I’m sure friends and family back home wondered what happened to me. (I do think I told them…again, no one had thought of Facebook.) It was a great solution. Not only was I curing my homesickness, but I had given those dollars a job…to save for my Magic Mill DLX Mixer – The Electrolux Assistent Bread Mixer. and grain grinder. It took many months of diligence, I found other creative means to save as well, that when the time came to finally order, I had no regrets, paid cash, and was on my way to one of the best investments to date. I choose to skimp lavishly on some things, so I can save, pay cash and invest generously in others. That’s what frugal, yet smart, financial living is all about – freedom. So what about you? Have you ever skimped in one area, so you could spend in another? I’m terrible about saving up for things…….that’s why Swagbucks are fantastic for me! !…..I got my Kitchenaid Mixer for 1/2 price with my Swagbucks! I could have gotten it for free had I been a little more patient and waited longer. I am JUST like you…even when I save, I still can’t bring myself to spend any unnecessary money!! I’m very frugal!! I often turn to Craigslist before I buy anything now days. I’ve purchased everything from kitchen items, furniture, even a lawn tractor (which were all items we would have had to buy anyway). I can usually find them for 1/3 the price of brand new, and if I search long enough, I can find great quality items too. Thanks for encouraging those of us who LOVE to save!! I am jealous for your 18 years with your kitchenaid. I had mine 12 and it is wearing out. It won’t turn off, so I have to plug and unplug it! But I also use it for all my bread dough, so I work it pretty hard. My dream would be to have your grain grinder/dough mixer, too. And I want a vitamix. Earlier this year I bought a new laptop (YAY!!! ), with savings — cash I had tucked away, here and there. I need to get more intentional about that again, and save up for the vitamix! Blessings! Thanks for hosting! I’ve been around a while, so I have a nice collection of kitchen utensils, including a great stainless steel pot and my KitchenAid mixer (blood red) which are a couple of my favorite tools! It sure helps to have good tools to work with! Every now and then I see something else that would be a nice addition. One thing that has proven to be a favorite kitchen tool of mine is something I was given as a wedding gift. It is the large coffee urn, and it makes it possible to have big parties and keep the coffee goodness flowing, without being tied to a small coffee maker. It’s a great tool. One tool I don’t have right now that I wonder if I should invest in … a food processor. I’ve been the food processor for a while, so it makes me think I should go without. Maybe I’ll put it on my Christmas list. @Julie@comehaveapeace, I got my food processor through Free Cycle. It’s not very big, but it does alright. I’ve had it for at least 5 years, and while I’d appreciate a more heavy duty machine, it does do the job when I want to grate zucchini/cheese/soap/potatoes/what-have-you. So, you might check out Free Cycle – you never know what someone might be willing to get rid of! I’m lucky because whenever I’ve wanted/needed a nice kitchen appliance, I’ve asked for and received it for Christmas or my birthday. Last year the only thing I asked for was a Kitchen Aid stand mixer because I know how expensive they are. My parents bought me the 4.5 quart one on sale and I think it was the best birthday present I’ve ever gotten! Like Julie, the next thing I need is a nice food processor, but since I’m buying a house (yikes!) and my parents are going to help me furnish it (yay! ), I think it’s something I’m going to have to save for. That will definitely take some pinching in certain areas. If you cook, you need quality tools. I love my good knives and kitchen aid mixer. I’ve never heard of the Magic Mill. I’m going to go google it! Love your phrase “skimp lavishly”. My sister just gifted me a Vita-Mix with grain attachment. Guess I should get busy grinding wheat and mixing up dough! Have I ever skimped in one area, so that I can spend in another? All the time. Isn’t that part of living frugally? I have a Bosch mixer and separate grain grinder. Does the Magic Mill grind as well? Do you like the scraping action it does? I think I’d prefer that to the Bosch. One year, I didn’t buy any new clothing, not one piece. All the the money saved went towards a car. I decided I had good clothing, it would last a year and we needed a second vehicle more than I needed a new pair of jeans. I have to encourage to go deep and buy a Vitamix. I’ve had mine nearly 3 years and still use it at least once a day. My husband knows his job will be gone in January so I totally understand being frugal. I am so watching every penny right now, but if you can save for that you will not regret it. I love mine. I have a nutrimill and bosch – again, a huge expense up front, but the health of the family is benefitting. Bless you for all your encouragement to all of us! Quality kitchen tools are a must. Speaking of which, I really need new knives. Thanks for hosting. It looks like a lot of us have pumpkin on the brain! Looking forward to exploring everyone’s ideas! I am a kitchen appliance snob (big or small). So I definitely work as much magic as possible to get the good stuff! Thanks for hosting this party each week. I’m always happy when I get a chance to join the fun. I already picked up a few new recipes and blogs to read. I saved for an Oster Kitchen Center when my kids were tiny. That thing was a workhorse with a mixer, blender, food processor, grater, shredder. I finally, after many years of use broke the food processor blade and learned that I needed “more power” to make a 2 loaf batch of bread dough so I saved for a industrial strength KitchenAid mixer. My old Oster Kitchen Center is now living at my mother’s house since the motor on her’s was burning out and mine was still in good shape. My son and DIL gave me a nice blender to use when I need one (they had extras due to being given 3 for wedding gifts) and my mother is getting me a nice food processor for Christmas. I also saved up to buy a nice pots and pans set. I had my original set from when I got married 25 years ago and wanted something that cooked a bit faster. All of these purchases were made during times when we did not have much money coming in but I saved like crazy to get them. Here is another handy kitchen item that I think every kitchen should have and is not expensive. Splatter guards for your frying pans. They have saved me many a burn and shirt! I often find these for a set of 3 under $10 at ROSS. I just bought my dream kitchen item this past spring – a Bosch Universal Mixer. I think it’s pretty similar to the one you have! I had been drooling over one, but couldn’t afford it so I went with a cheaper one (I sold a bunch of little things to get the money for it) and just wasn’t happy. I ended up gifting that one to my mom (my parents had separated) and found a pretty good deal on craigslist for a Nutrimill Grainmill and the Bosch mixer – plus a bunch of grains to go with it and a gamma bucket/lid combo. I was able to sell a sewing machine on Ebay that I bought off CL super cheap to fund 80% of it and the rest came from birthday money. Score! There have been two major kitchen appliance purchases I’ve made, both within a year of each other. One was my Kitchen Aid Mixer, the BIG one where the bowl snaps onto the stand. I had had the smaller one, where you thread the bowl on (like a screw), but it didn’t hold up to bread making. The other one is my Cuisinart DLC 7Pro. Honey, it makes pasta dough and dough for rolls in two minutes! Shreds, slices, dices, and purees with the best of them! I bought them each for around $300 (I was a single working girl living at home still)…. wait for it….. THIRTY years ago! They are still in perfect working condition. I’ve had to replace the food processor lid, but that’s it. The motors are fabulous and so strong! This is my first time linking up, but it was fun! Thanks for hosting! Speaking my love language now. I love to invest in quality and it pays for itself. See how long it has lasted right! 🙂 Love it! @Carolinamama, Sorry, but when I first glanced at your comment, I thought you wrote “Love lasagna” which made perfect sense to me! We skimp on many things so we can afford to eat “lavishly” on organic food. It is a choice we feel we need to make for the health issues in our family. WHEN I WAS SINGLE I WORKED 2 JOBS JUST TO MAKE ENDS MEET. I ALSO HAD A LITTLE ONE TO TAKE CARE OF. MY BIGGEST INVESTMENT WAS MY CROCKPOT AND THE I BOUGHT A FOOD PROCESSOR. SIDE MOUNT MOTOR IN WHICH I STILL USE TODAY. IT IS ABOUT 24 YEARS OLD NOW. MY MOTTO IS IF IT AINT BROKE DONT FIX IT. STILL LIVE AS FRUGAL NOW AS I DID BACK THEN. Hi Jen, I love your blog and have been enjoying reading it. 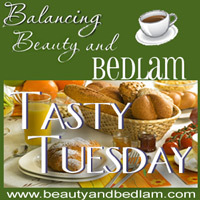 I got so excited about diing my first link up for tasty Tuesday that I forgot to link back! I just glanced over the “rules” again and realised so you are now linked properly! So sorry! I’m just getting the hang of this blogging thing! I love spending time in my kitchen, and yet I think that’s where I save the most money. My pots and pans are a great set given to be by a lovely couple on CraigsList, who were moving back to Scotland and were giving away many items. My Kitchenaid mixer was a Christmas present last year (an awesome deal at Kohl’s that my gram found). I save on food like you wouldn’t believe (helps that I only cook for 2), make do with what I have, and am constantly looking up substitutions for ingredients so that I can use what I have. Just wanted to say thanks for hosting! And I love my Kitchen Aid mixer, though hubs got it for me as a Christmas gift. However, we *never* spend that kind of money on gifts! He knew that it would be a big help with my baking and pay off with time saved – he was right!